PT: Before we dive into the mechanics, let's cut to the chase-what's going on here? And, why should California voters care about legislative redistricting? McCarthy: You need to look at the structure of today's politics: the power of the primary and a working place far from home. McCarthy: The primaries are very much controlled by the parties Fewer people turn out. Less money has to be spent because of fewer voters. So, it's the political insiders who determine the winners rather than the voters. That's not the way elections should work. Because of this system, the minority party will not be able to attract better candidates in those districts. They won't get the amount of resources because people don't think they can win. When you get to the general elections, there's no real contest. The results are tied by the registration numbers in a particular district. Even if you have a strong minority party candidate, the districts have been made so far one way, there's not enough swing voters to win the election. PT: And, you said there was a second force? McCarthy: The "factory" where laws are made is far away from the district. And the people who run the factory are the party leaders in the Capitol. So you cater to them. That party structure beats the members down and eventually starts dictating their behavior. I believe legislators should fight the current system and go home to the district. I want the structure to force me to go home to my district and send my colleagues back to their districts to be accountable to their voters. Under the current system, there is no motivation to go back to the district. Members hold a majority of their fundraisers in Sacramento. You get so engrained in politics, you forget about the people. PT: So, connect the dots-how will legislative redistricting change that structure? What happens to well-intentioned officials when they arrive in Sacramento or Washington? And, why should California voters care if the incumbents are decent citizens and deliver the goods? McCarthy: If there's no fear of losing, you don't have to take on the competitive issues. When the driving force is incumbency, there's no need to work, no reason to change So, there's no accountability in government. For example, so far this year, the Legislature has spent more time debating a bill that would prohibit the use of the term "redskins" as a school mascot, than debating the state's budget deficit. Why? There's no motivation to do so. Why would an incumbent tackle tough issues like the energy crisis, workers' compensation, or the budget if they are guaranteed to get re-elected? PT: That brings up the whole subject of "legislative gridlock." You mentioned some other ideas on reforming how the legislature can be more effective. McCarthy: For starters, I believe that we need to make two changes relating to committee structure and floor debate. First, I would change the whole committee structure and force people to get out of Sacramento. For example, I would encourage the Agriculture Committee to have hearings up and down the Central Valley, to hear from those who are directly impacted by their policies, not special interests in Sacramento. Again, it would get people out of Sacramento to focus on policy, not politics. Committee assignments are controlled by 1-2 people. We live under the old structure of Willie Brown as the Speaker. From where you park to where your office is to where you sit on the floor. Why hasn't that changed? The power of 41 - the party that controls a majority of the 80 Assembly seats can do pretty much anything it wants. To encourage floor debate, we should allot time for debate on each bill. The idea would win. There's no reward for doing the tough job. PT: You have a redistricting bill pending in the Assembly and the Governor is also backing a referendum (initiative) campaign. Isn't this a little confusing? McCarthy: The Governor and I want to accomplish redistricting legislatively. Due to the lack of motivation to work together in Sacramento, the Governor may have to bypass the Legislature. Under both proposals, the basic idea is to keep cities and counties whole; one senator, two assemblymen per district; and, districts to be drawn by a bipartisan panel of judges selected according to certain criteria. PT: What's are the differences between the Assembly bill and the referendum? McCarthy: There are three major differences. First, my bill encourages the Legislature to have as little to do with the redistricting process as possible. For constitutional reasons, the initiative must have some legislative involvement because you cannot take power away from one branch of government and give it to another through an initiative. Second, under the legislative bill, the panel of judges must reflect the ethnic make-up of the State as much as possible. That's not required in the Initiative. Third, the Assembly bill is self-executing. In other words, once the judges draw a map, it takes effect. Under the Initiative, once the map is drawn, it still must go to the voters. PT: But, won't today's reformers become tomorrow's incumbents—5-6 years down the line? McCarthy: Yes, incumbents will still have the fund raising advantage, ability to mail. But, fund raising won't be as strong—now, people know that the incumbent will always win. There will be greater competition for assembly seats. You will have people challenging incumbents before the term limits are up. This will introduce incumbents to real accountability and competition, which is a good thing. PT: As critics of the reform movement have pointed out, the State's voters have never passed a successful redistricting plan— despite 50 years of trying. Why will this time be any different? McCarthy: No one has ever put the resources into it before. People haven't understood redistricting. They now have a better idea about the power to change government. Now, we have a governor who was elected directly by the people. And, there's editorial support - the average person can understand what's at stake. When this story was written in 2004, Kevin McCarthy represented the San Joaquin Valley's 32nd Assembly District and held the position of Assembly Republican Leader. McCarthy was subsequently elected to Congress in 2006 to represent California's 22nd Congressional District. 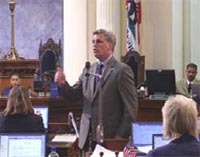 McCarthy earned his BA and MBA from California State University, Bakersfield.